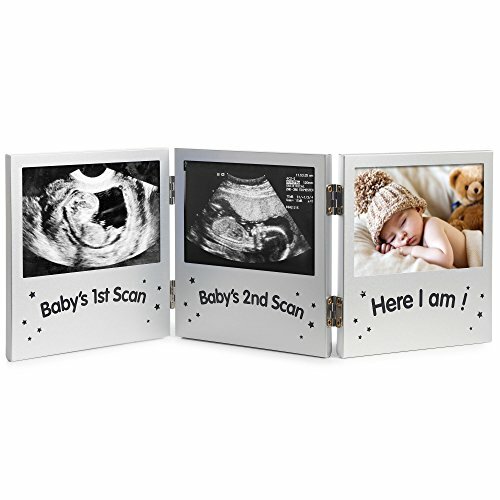 This VonHaus Baby Scan Photo Frame is a perfect reminder of each stage of pregnancy to display in a nursery or living area. What's even more special is you can add a photo of your beautiful baby in the final picture frame so you can visibly see each memorable stage. This beautiful stainless steel frame will fit into any environment within the home so you can have a constant reminder of that precious time. The double hinged design allows you to alter the angle and position of the frame perfectly within the home. This design ensures these precious photos can stand alone and therefore not be at risk of falling over. This is a unique and valuable experience so you don't want these precious scans to be at risk of being lost or ruined. This beautiful photo frame set is ideal to buy either for yourself or as a unique and personal gift. Ideal for baby showers, a new mother announcing her pregnancy or the birth of a new baby. Treat that friend or family member to a present they will never forget. Double Hinged for Optimum Positioning and secure positioning. Fantastic and Unique Gift and Keepsake for Friends + Friends. To fit scan sized photos.